California Knife & Blade manufactures and supplies a wide range of replacement industrial blades for food processing machinery brands such as Urshcel and FAM. Urschel replacement blades are made in different grade stainless steels for best performance and longer life time. For over three decades California Knife and Blade manufactures and supplies highly durable food processing blades With our well-trained and highly experienced team combined with our in-house high-tech CNC and Wire EDM machines, we manufacture and supply only quality Urschel replacement blades at the most competitive price delivered within the shortest leadtime in the market. 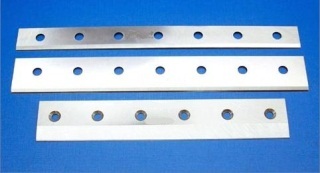 We are able to supply all models of Uschel replacement blades readily from stock. If you are looking for a company to get your next Urschel blades supplied by, you can count on us for our exceptional quality, on-time delivery performance and competitive prices. Let California Knife & Blade help you get the best quality Urschel replacement blades at a competitive price within a very short lead time. Our expertise is our capability to manufacture and supply Urschel blades with the quality exceeding customer's expactation at a competitive price within a short delivery time. Please contact us now to get a quote.